The Royal Malaysian Police (RMP) said the chemical weapon VX was the toxin used in last week’s assassination of Kim Jong Nam, the estranged half-brother of Kim Jong Un, in a statement released on Friday morning. VX, also known by its full name N-2-Diisopropylamino Ethyl Methylphosphonothioate, is a highly toxic substance which is odorless and tasteless. 10 milligrams is said to be sufficient for it to be fatal through skin contact. 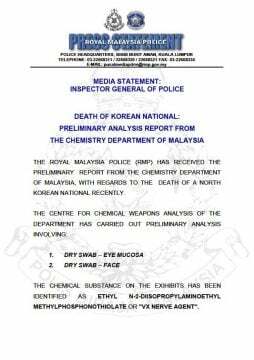 “The Royal Malaysian Police has received the preliminary report from the chemistry department of Malaysia, with regards to the death of a North Korean national recently,” their statement read. The department carried out its analysis through dry swabs of the victims’ “eye mucosa” and face, and concluded that the substance used was VX. Preliminary reports of the attack on Kim Jong Nam suggested that one of his assailants at Kuala Lumpur International Airport covered his face with a cloth laced with a liquid, with preliminary autopsy reports refuting South Korean media claims that he was stabbed with a poisoned needle. 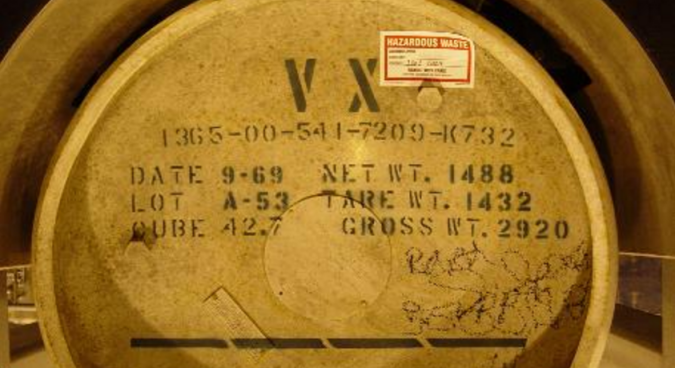 More than 100 times more deadly than Sarin gas if inhaled, the confirmation of the use of VX paints a grim picture of Kim Jong Nam’s final minutes. Emergency treatment for the agent is to get the patient naked and wash the body, sanitizing and cleansing the contacted area, Jeong said, adding that Kim might have survived had airport staff been able to identify which poison had been used. The substance has no known use beyond being a chemical weapon and is classified as a weapon of mass destruction by United Nations Resolution 687. It was most notoriously used by the Japanese Aum Shinrikyo cult in its 1994 and 1995 attacks on three individuals. The U.S., Russia, and Syria are all believed to possess stocks of the substance. Stockpiling more than 100 grams of VX is outlawed by the Chemical Weapons Convention of 1993. While the government of North Korea has not been blamed by Malaysian authorities for last week’s fatal attack on Kim Jong Nam – who has yet not been officially identified – eight North Koreans have been linked to the murder. North Korea is one of only six countries who are not signatories to the Chemical Weapons Convention, and an overview by the Nuclear Threat Initiative (NTI) of North Korea’s WMD capabilities named VX, along with Sarin, as “the focus of North Korean production”. The DPRK insists it does not possess chemical weapons. 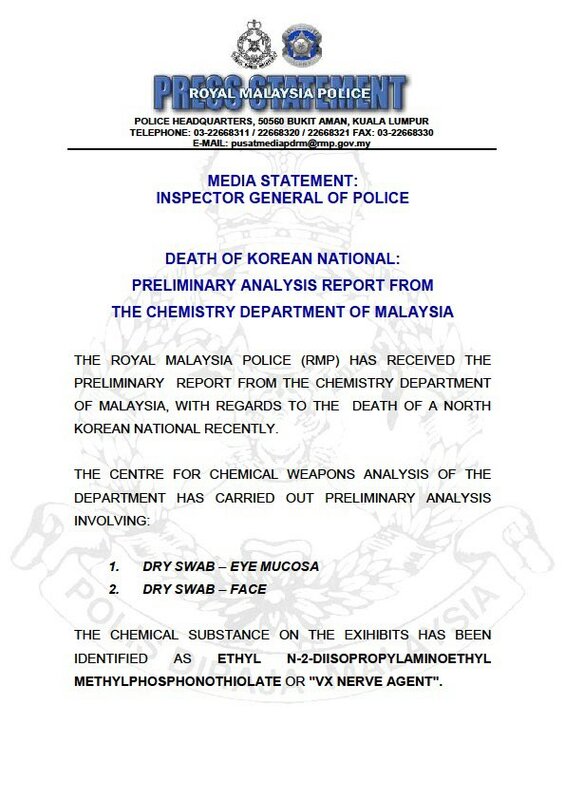 The Royal Malaysian Police (RMP) said the chemical weapon VX was the toxin used in last week’s assassination of Kim Jong Nam, the estranged half-brother of Kim Jong Un, in a statement released on Friday morning. VX, also known by its full name N-2-Diisopropylamino Ethyl Methylphosphonothioate, is a highly toxic substance which is odorless and tasteless. Subscribe to read the remaining 636 words of this article.